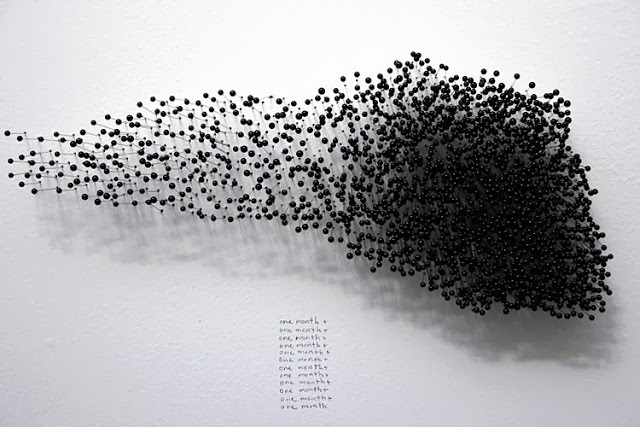 Katie Lewis uses simple materials like pins and thread to create her artworks, which are based on data she collects about her own “bodily sensations” – but she won’t tell you what sensations she’s measuring. Twinges in the back? Rumbles in the tummy, perhaps? She says she uses a very strict method to collect and visualize her data, but she won’t tell you what her method is, either. According to Lewis, it’s all about questioning medicine and science’s view of the body as a quantifiable and endlessly analyzable thing. Color me conflicted. On the one hand, I understand the artist’s resistance to the idea that every aspect of the self and the human experience can be quantified, crunched and displayed in neat charts. On the other hand, a lot of it can be quantified, and creating art from the data can be beautiful and meaningful, if never the definitive measure of a life. You can see more of Katie Lewis’ art at her website. This entry was posted in The Art of Science and tagged Data Art, Data Visualization, Katie Lewis, science art. Bookmark the permalink.